The early results of the Trump administration’s Afghanistan strategy about nine months in are mixed, according to a government watchdog report released this week. The Afghan government’s control of its population has increased one percent since December, from 64 percent to now 65 percent, according to the Special Inspector General on Afghanistan Reconstruction’s report. The goal is 80 percent of population control by 2019. Meanwhile, Taliban insurgents’ control of the population remained the same at 12 percent, but contested areas decreased from 24 percent to 23 percent, according to the report. The number of security incidents across the country is also down. However, at the same time, the number of high-profile attacks in urban centers is rising, the report said. “The winter months saw an unusual surge of violence in Kabul, reflecting the insurgency’s shift to launching successive attacks on civilians in the capital in response to increased [Afghan National Defense and Security Forces] pressure in the provinces,” it said. On January 27, the Taliban detonated a car bomb near the Ministry of Interior headquarters in Kabul that killed at least 103 people and injured 235. Just this Monday, a suicide bombing in Kabul killed at least 25 people, including at least nine journalists, and wounded 45 more. Islamic State-Khorasan claimed responsibility for the attack. Another suicide bombing in Kandahar the same day killed 11 students and wounded 8 Romanian soldiers. No group has claimed responsibility for that attack. The Pentagon also announced on Monday the second U.S. combat casualty of the year in Afghanistan, which was unrelated to the bombings. Defense and military leaders say the high-profile attacks are occurring because the attackers cannot win on the battlefield. Defense Secretary Jim Mattis expressed similar sentiments and said the attacks are expected. We anticipated, and are doing our best, and have been successful at blocking many of these attacks on innocent people. But unfortunately, once in a while, they get through, because any terrorist organization that realizes it can’t win by ballots and turns to bombs — this is simply what they do: They murder innocent people. “We’ll stand by the Afghan people. We’ll stand by the Afghan government. And the NATO mission will continue, as we drive them to a political settlement,” he added. The Trump administration’s strategy in Afghanistan, announced in August, entails deploying more U.S. and coalition air power and support for Afghan forces fighting on the ground to enable them to go on the offensive. 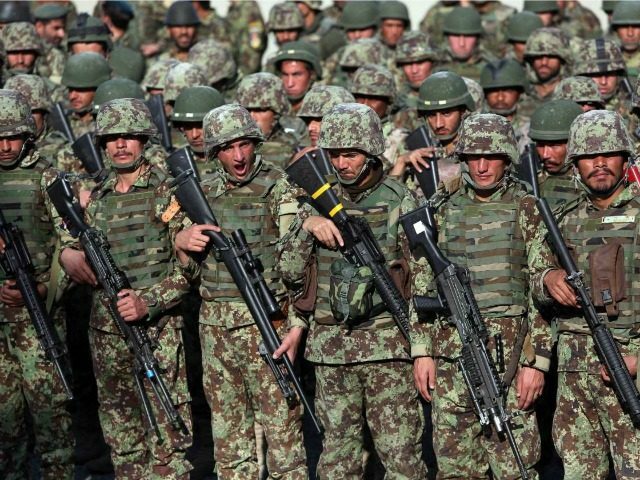 It also entails doubling the size of the Afghan commando force and air force. According to SIGAR’s report, more than 1,186 bombs have been dropped — the highest number recorded for this period since reporting began in 2013 and more than two-and-a-half times the amount of bombs dropped in early 2017 as the Trump administration was just taking over. There are about 14,000 U.S. troops in Afghanistan, with more than half involved in training Afghan forces to fight against the Taliban and the rest involved in going after terrorists on the battlefield.